For Ron ’80 and Jane ’80 Lindsay, giving back to the University, its students and the community is a large part of who they are. The Lindsays mentor students through their church, opening their Lake Keowee home for student retreats. They are involved in providing financial-literacy counseling for people with long-term financial problems. Ron Lindsay supports the College of Engineering, Computing and Applied Sciences as a member and former chair of its advisory board. He was recognized for his service in 2016 when he received the college’s highest honor, induction into the Thomas Green Clemson Academy of Engineers and Scientists. He is also one of the original members of the Leadership Circle, a group of donors who provide unrestricted gifts to support student engagement, faculty advancement and academic opportunities that shape tomorrow’s leaders. Their latest gift — $1 million to the College of Engineering, Computing and Applied Sciences to fund scholarships and professorships and to meet the college’s greatest needs — is built on that same spirit: “We’re giving money to the dean to have flexibility to do things he needs to do as needs arise,” Ron said. Ron grew up in North Augusta, South Carolina, and Jane is from Mount Pleasant. They met at Clemson, and both graduated with bachelor’s degrees — his in chemical engineering and hers in economic biology. 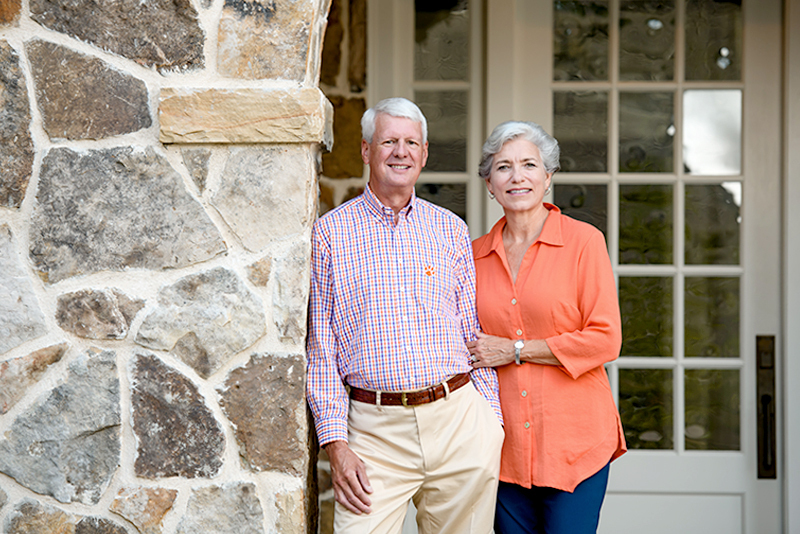 After retirement, the Lindsays moved to their lake home about 30 minutes from campus. The move put them closer to their three grown children — Ryan, Elizabeth and Lauren — and their 2-year-old granddaughter, Blake. The Lindsays’ return to the Upstate gives them a chance to get to know the students and professors they are helping.